In the Colonies expansion for Terraforming Mars, players can send their trade fleet to distant worlds and bring home valuable goods. The colonies of Titan specialize in producing floating infrastructure – floaters! So what are floaters used for? If you’re familiar with the Venus Next expansion, you’ll know that floaters are indispensible for colonizing the clouds there, making for excellent interaction between these expansions. But Colonies is also ripe with floater cards. Titan has a suitably dense atmosphere, but so do Jupiter and Saturn, and the Jupiter Floating Station is just begging for some help in its construction and expansion so that it can yield a good profit. There’s just one catch – you need some serious technological advancement in order to colonize Jupiter itself, what with the strong radiation and violent storms (and no place to land). The best way to solve this issue is of course to develop Floater Technology, both supplying the know-how (science tag), and floaters if the Titan colonies are not available to do it! Of course, these are just ways to get the Floating Station going, but it can just as well be used to support other floater projects in the outer solar system, such as the Jovian Lanterns. 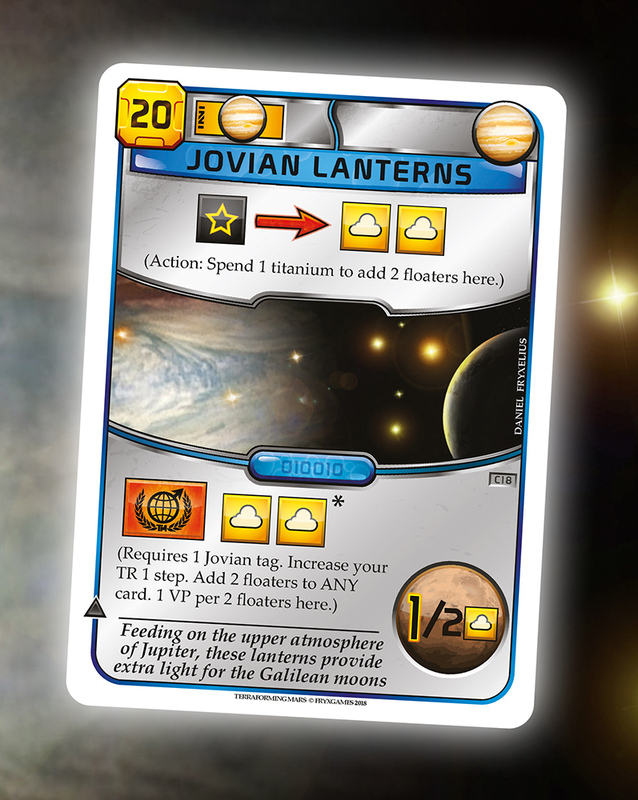 It is also one of the cheapest Jovian-tagged cards at only 9 M€, making it extra valuable in combination with one of the Jovian-scoring cards from the base game. Previous post: Mac is here!